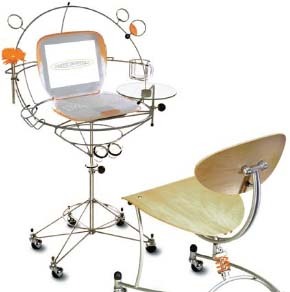 The Virtual Office by Joey Manic is my ultimate dream desk. It seems to have been made with only two things in mind: style and organization. Let's take organization first. In the Virtual Office there's enough room for a little of everything, but absolutely no purchase for unwanted clutter. You can keep a few papers in plain view with the "file cabinet," store a pen or two in the "drawers," and even keep your cell phone close at hand. But that's all you get. This desk is tough love if you're like me and your office is arranged in either heaps, piles or heaps of piles. But oh what love it is. And then there's style. Let me point out that this beauty comes equipped with a rearview mirror so you can tell if someone's coming up behind you (or check your appearance before they get there), and a flower vase to brighten your day. And what about these "drawers" I mentioned earlier? The two glass holders on the bottom. Family photos? The clips on the top left and top right. File cabinet? A rack that will hold a few papers, which is all you should be working on anyway. It's also got a swivel base for your laptop and a round tray for mousing. You can tell this is an older design, though, because the rack on the right side is meant for CDs. We'd rather have an iPod holder. The bad news is that the virtual office is a victim of its own success. It proved so popular that Joey Manic had to outsource its construction. But it's so complex that it costs too much for someone else to make it. So it's been discontinued. I hear that there may be a few kicking around that were shipped to retail stores but that may not have been sold yet. This site shows pictures of someone who not only successfully procured a Virtual Office, they also mated it with an iMac. If you have a Virtual Office you want to sell or know where to get one, let me know. You can still find the Virtual Diner in some retail stores. It's the TV tray equivalent of the Virtual Office. It even comes with little salt and pepper shakers.